A FEW MINUTES AFTER I LEAN MY BIKE AGAINST THE FLYING BISCUIT, a legendary Atlanta breakfast joint, one guy tells me how he witnessed a shooting on this same ride earlier in the month. Before that, it was an armed robbery. "Guy pulled his gun out and shot it in the air," a skinny rider with lights on his helmet and handlebars says. We're standing on the corner of trendy Candler Park, one of those Atlanta burgs on the happy end of transitional. More riders show up as it gets closer to dark. It's mostly dudes, some wearing Lycra kits, some in wife beaters and cutoff shorts. This is the mid-week ride for Faster Mustache, a club that organizes everything from the Georgia State Singlespeed Championship to monthly hashes. On weekends, they hit singletrack in northern Georgia or North Carolina. But Tuesday night is the Dirty Mustache Ride: 20 miles of roads, stairs, broken sidewalks and singletrack on the edge of downtown. These aren't glamorous trails. Picture a knot of rideable dirt be- hind a medical center. Some redefined and expanded hobo trails beneath power lines. A spaghetti-like pocket system behind one of the city's most notorious housing complexes. Put it all together though, and you've got a 20- to 30-mile night ride, more than half of which is on singletrack and all of it is fun. We bomb a roller coaster of dirt right next to a train track, splashing through mud pits in the valleys before digging deep, paper-boy style, to crest each hill. We get hassled by a security guard in the shadow of the Centers for Disease Control building, cross sketchy man-made bridges and drop countless sets of stairs. There is a long climb through the woods behind a medical center, then endless tangles of roots and washed-out sand pits on the edge of a river. Riding this dirt patchwork under the veil of darkness in the middle of the week is a blatant, beautiful act of desperation. "None of us gets out to the mountains as much as we'd like, so this ride is really important," says Eric 'Nico' Nicoletti, who pieced the route together two years ago during two months of unemployment. "Sometimes there are 15 of us, sometimes there are two of us. But the Dirty Mustache always goes. Every Tuesday." The ride ends with a group sprint up a steep, grassy hill next to a playground. 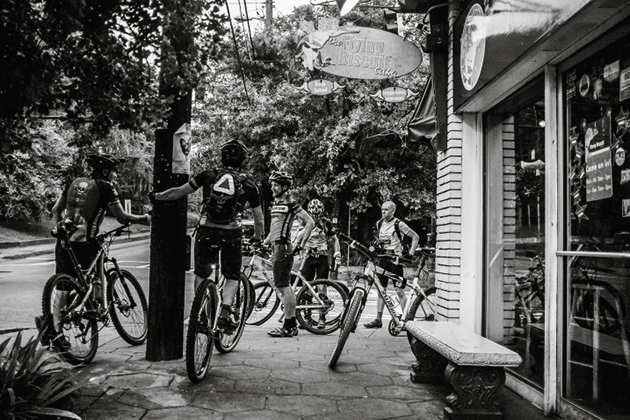 Around the corner, everyone throws in $10 at a pizza joint and we finish the ride with pitchers and pizzas.